The New York Health Act could expand insurance coverage in New York without increasing overall health spending, if administrative costs are reduced and growth in provider payment rates is restrained. Health care would be financed by taxes rather than by premiums and patient out-of-pocket payments. Substantial new taxes would be required. Depending on how progressive new tax rates are, health care payments would decrease among most residents and would increase among the highest-income residents. A single-payer health care proposal is currently under consideration by the New York State legislature. According to a RAND Corporation analysis, New Yorkers would use more health care under the single-payer plan than under the status quo, but overall health spending could remain about the same if there are administrative efficiencies and slower provider payment growth. The New York Health Act (NYHA) would create a state-sponsored single-payer health plan called New York Health (NYH). The plan would cover all residents of New York State, including undocumented immigrants and seniors over age 65 (if federal waivers are approved). Coverage would include medical benefits currently included in Medicare, Medicaid, and Child Health Plus and essential health benefits under the Affordable Care Act (ACA); long-term care benefits may be added later. Patients would have no deductibles, co-pays, or other out-of-pocket costs for services covered by the plan. NYH would be financed through a new trust with money from the federal government (in place of federal financing for current health programs, if federal waivers are approved), current state health care funding, and two new progressively graduated state taxes: a payroll tax paid jointly by employers (80 percent) and employees (20 percent) and a tax on nonpayroll income. 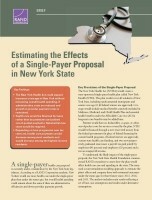 To understand the likely impact of the single-payer proposal, the New York State Health Foundation commissioned RAND researchers to assess how the plan would affect health care use and spending in the state. The team used a microsimulation modeling approach to estimate the plan’s effects and compare these with estimated outcomes under the status quo for three future years: 2022, 2026, and 2031. The analysis includes main results reflecting a set of base case assumptions and results under alternative assumptions. Federal waivers for Medicaid, Medicare, and ACA requirements are approved. 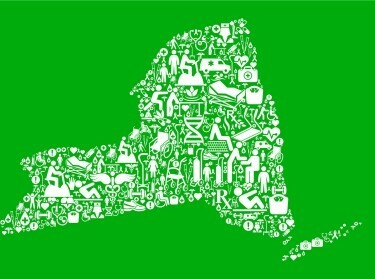 All residents of New York State have insurance coverage from the NYH plan. Provider payment rates in NYH are initially similar to the dollar-weighted average payment rate across all payers in the status quo and then grow at a rate equal to that in Medicare and Medicaid. The administrative rate in NYH is 6 percent of spending for health care services. The base case results reflect one possible NYH tax rate schedule with progressively graduated rates (higher rates for higher brackets of income) that could meet the financing needs of NYH. Under the status quo, the ACA continues without the individual mandate penalty. When cost-sharing is eliminated, people use more health care. Previously uninsured people would use more health care. Households with incomes below 200 percent of the federal poverty level (FPL) would have larger increases in health care use than higher-income households. Increased patient demand for services would not be fully met because of "congestion"—nonfinancial factors limiting the supply of services. NOTE: Bars may not sum to totals because of rounding. The NYH program would shift the types of payments people make for health care, with taxes replacing premiums and out-of-pocket payments for covered services (Figure 2). Under the NYHA, premiums would be eliminated and out-of-pocket payments by households would fall. After redirection of federal and state health care outlays to NYH, the additional state tax revenue needed to finance the program would be $139 billion in 2022, a 156-percent increase over the projected total state tax revenue of $89 billion under the status quo. One set of possible progressive tax rates that could fully finance the program ranges from about 6 to 18 percent for the NYH payroll tax and 6 to 19 percent for the NYH nonpayroll tax in 2022. In 2022, New Yorkers with household compensation below the 75th percentile would pay an average of $3,000 less per person for health care (a decrease from 24 percent of compensation per person to 14 percent). While average payments would fall for lower-income residents, payments would increase for some, such as those working for firms that previously did not offer coverage. For those in the 75th to 90th percentile of household compensation, average health care payments would decrease by $1,500 per person in 2022 (a decrease from 21 percent of compensation per person to 19 percent). For those in the 90th to 95th percentile of household compensation, average health care payments would increase by $1,700 per person in 2022 (an increase from 23 percent of income to 24 percent). The top 5th percentile of New Yorkers by household compensation—a heterogeneous group whose compensation will average about $1,255,700 in 2022—would pay an average of $50,200 more per person (an increase from 23 percent of compensation per person to 35 percent). NOTE: Household compensation includes household income and employer contributions to health care. The effects on employer health care payments vary by offer status and firm size. Employers who offer coverage under the status quo would contribute $200 to $800 less per worker for employee health benefits, on average, under the NYHA in 2022. Conversely, employers who do not offer coverage under the status quo would pay $1,200 to $1,800 more per worker, on average, because of the mandatory payroll taxes under the NYHA in 2022. High-income residents may change investment decisions or move out of state to avoid taxes. Because new taxes to support NYH fall disproportionately on a small share of the population, even a small amount of tax avoidance could substantially reduce the funding base. Businesses may make similar decisions to move out of state or change production approaches—such as shifting labor to capital—to reduce payroll tax obligations. These responses might be limited to businesses that do not currently offer health insurance, as they would pay more under the NYHA. Firms with out-of-state workers may also be at risk of shifting more labor out of the state. Providers may relocate to other states in response to lower provider payment rates. To test whether results from the base case analysis would vary using different assumptions, the analysis considered a range of alternatives (selected scenarios shown in Figure 4). Differing assumptions about provider payment rates, administrative costs, and drug prices could have the most-substantial effects on estimated spending under the NYHA—ranging from savings of up to 15 percent to increases of 12 percent in 2031. If the NYHA included long-term care benefits, spending could be 5 percent higher in 2022 and 2 percent higher in 2031. If the NYHA included modest cost-sharing, spending could be 2 percent lower in 2022 and 4 percent lower in 2031. NOTE: In the alternative scenarios combining provider payment rates, administrative rate, and drug payments, the higher-cost alternative assumes that the average annual growth in NYH provider payment rates equals that of private payment rates under the status quo (rather than public payment rates in the base case), the administrative rate is 12 percent (rather than 6 percent in the base case), and drug payments in NYH are 2.5 percent higher than under the status quo (rather than drug prices 10 percent lower than Medicare prices in the status quo). The lower-cost combined scenario assumes that provider payment rates are 5 percent lower than under the status quo, the administrative rate is 3 percent, and drug prices in NYH equal Medicaid prices under the status quo. The modest cost-sharing scenario assumes a 95-percent actuarial value plan for households with incomes above 250 percent of FPL (rather than a 98-percent actuarial value plan for everyone in the base case). This analysis shows that a single-payer approach in New York could expand coverage while reducing total health spending, assuming that the state is able to negotiate slower growth of provider payments and trim administrative expenses. While these assumptions are reasonable, they are also highly uncertain and depend on providers’ bargaining power, the state’s ability to administer the plan efficiently, and the federal government’s willingness to grant waivers to the state. The analysis also assumes one possible progressive tax rate schedule to finance NYH. This tax schedule would reduce average health care payments for a majority of the population; however, the viability of this tax schedule assumes that few high-income residents find ways to avoid taxation. If only a small percentage of the highest-income residents found ways to avoid taxes, the schedule would need to be reworked, potentially increasing the burden on middle- and lower-income residents. Overall, these results suggest that the single-payer option has the potential to lower payments for the majority of New Yorkers, but the results depend on assumptions about uncertain factors. Liu, Jodi L., Chapin White, Sarah A. Nowak, Asa Wilks, Jamie Ryan, and Christine Eibner, Estimating the Effects of a Single-Payer Proposal in New York State. Santa Monica, CA: RAND Corporation, 2018. https://www.rand.org/pubs/research_briefs/RB10027.html.